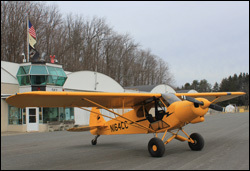 I learned about Andover Flight Academy in the December issue of AOPA Pilot, where it was positioned as the premier place to earn a tailwheel endorsement. I have always loved the idea of bush flying and flying a taildragger into remote airstrips. Soon after reading the article I found myself in New Jersey and made sure to make my way over to Aeroflex-Andover Airstrip, a picturesque and cozy little airport nestled between two lakes in the hills of Northern New Jersey. Stepping into the Andover Flight Academy office is like stepping into the past. 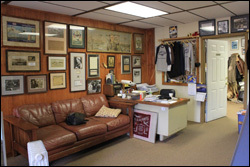 Their office is adorned with a ton of memorabilia and their primary seating for ground school work is a comfy worn in couch. Before getting in one of Andover's aircraft I watched Tailwheel: 101 a DVD developed by CFI and Owner of Andover Flight Academy, Damian DelGazio. The DVD did an excellent job discussing the basic procedures used for flying a tailwheel airplane and knowledge and skills needed to earn a tailwheel endorsement. After signing up for instruction I had spent significant time thinking about ground loops and prop strikes, the two dangers I associated with tailwheel flying. The DVD did a great job of explaining the causes of the ground loop and how to prevent one from occurring. I also learned that while performing two point landings on the main gear that it is actually quite difficult to cause a prop strike. With those concerns vanquished I had a clear mind to focus on taking my new knowledge and putting them to work. If you are interested in a earning your tailwheel endorsement I highly recommend you check out Damian DelGaizo's Tailwheel 101 DVD. As we rolled the TopCub on it's Alaskan Bush Tires from the hangar I quickly forgot that I was in New Jersey. Despite being within an hour of New York City I was transported into my mind to the wide open West or Alaskan backcountry. Damian talked me through the taxi procedures and we did some slow and fast taxing to get used to the necessary rudder controls to maneuver safely on the ground and to simulate the controls needed after landing to prevent a ground loop from developing. Once I had proven I had a handle of ground control I rolled us onto the grass and applied power steadily and let the tailwheel fly itself off the ground then brought in some back pressure and the TopCub leapt into the air. I am confident it was the shortest takeoff roll I have ever made. Who knew takeoffs could be so fun, but there is something exhilarating from going from stand still to airborne in such a short distance. Once aloft we spent a few minutes working on stalls and general airmanship in the TopCub. The TopCub is at its heart a very simple aircraft, and I loved that. The only glass panel was the iPhone in my pocket and there was no autopilot to shoulder the load, and I loved it. Damian quickly spotted some rust on my stick and rudder skills. He gave me a few pointers and in a few minutes I felt at one with the TopCub. As we approached the nearby turf strip at Trinca Airport he gave me the final tips for making a successful three point landing. I followed his instruction and flew the approach with my eyes focused straight ahead until I was ready to flare at which point I transitioned to looking at the runway edges as the nose blocked my forward visibility. A few feet off the runway I flared and brought the plane to a full stall and gently brought the two Alaskan Bush tires & our tailwheel to the ground in unison. I quickly transitioned to focusing on using the rudder pedals to control the plane on the ground while we bled of the remaining speed, success I nailed my first tailwheel landing! Landing on turf has always been one of my favorite aviation experiences but it was even more fun and challenging in a tailwheel aircraft with big Alaskan bush tires. Damian is a phenomenal instructor and coach. Before and during the flight he consistently asked "Does that make sense to you?" He genuinely was looking to make sure I was comfortable with the information and if not he clearly walked me through it. I understand why people like Harrison Ford sought him out for training. I logged 1.0 hours of tailwheel experience and made four three point landings. Next time I am in the area I will return to Andover Flight Academy to work on main wheel landings and continue working towards a tailwheel endorsement which might come in handy for some of the other exciting flying I have planned for this summer. More on that in the coming weeks. Also, it can be really cost-effective to do a "rating vacation" for something like tail wheel. I got my ASES in FL that way a few years back. I'd do it again! I very seriously considered going to Alaska this summer to get a seaplane rating but it did not work out for this summer. I think I will focus on the tailwheel endorsement this summer then maybe seaplane the following year. I'm on my way to get my ASES but now you have me considering a tailwheel endorsement. Also, Welcome to NJ! Tail wheel endorsement is a good thing. It opens up the opportunities to fly and in a very cost effective manner.